A mile-by-mile guide to the longest contiguous US Highway in the United States, US Route 6, also known as the Grand Army Of The Republic Highway, has been virtually ignored (and often confused with Route 66) until now. Malerie Yolen-Cohen has just released the first mile-by-mile guide to the longest contiguous US Highway, Route 6. 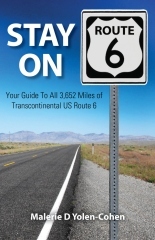 Stay On Route 6; Your Guide to All 3,652 Miles of Transcontinental Route 6 is jam-packed with advice on the best attractions, shops, restaurants and lodgings through fourteen US States. Cruising the mostly two-lane US Route 6, road-trip enthusiasts and historians will discover the real America; from the Technicolor gardens and forests in the East to the sepia tones of the Western desert through some of the friendliest cities and towns in our country’s midsection. Most are not tourist destinations; but for road-trippers, that’s part of the joy of discovery. And in many of these locales, inhabitants welcome strangers with open arms, introducing travelers to the places where they themselves eat and shop. Historic Route 6 begins and ends in flamboyant, artsy, touristy, entertainment-rich Oceanside towns. Provincetown, MA on the Atlantic Ocean draws playwrights, gay activists and tons of tourists every summer. Long Beach,CA on the Pacific Ocean, an outer-borough of Los Angeles, is rich in glitz of a similar sort. What’s in between (in Rhode Island, Connecticut, New York, Pennsylvania, Ohio, Indiana, Illinois, Iowa, Nebraska, Colorado, Utah, and Nevada) is a virtual time-line of American history. Revolutionary War sites in New England give way to pioneer homes in the plains and prairies of Iowa and Nebraska, and eventually to the stark silver and gold mining camps in Colorado, Utah, Nevada and California. Route 6 travels through two towns called Brooklyn, and neither are in New York. It touches two oceans, runs along the shore of one Great Lake (Erie), crosses most of the country’s major rivers, traverses five state capitals, climbs, exhilaratingly, up and over the Continental Divide, meanders through land both barren and lush, and rewards drivers, bikers, RVer's and even walkers with the best that America has to offer. Discover long ignored US Route 6 through the Stay On Route 6 Website or through Stay On Route 6 or Amazon.com. In addition, you can contact non-profit Route 6 Tour Association director, Russel Lombard through the Route6tour website. With credits in National Geographic Traveler, Ladies Home Journal, Newsday, Sierra, Paddler, and dozens of other publications, freelance travel writer Malerie Yolen-Cohen has been writing about the most exciting and unique places to see, stay and eat in the USA for over 20 years.